Where you can place your NQMPs is decided in cooperation between you and the dice. The different kinds of buildings in the villages have numbers, and you can only place your NQMPs on buildings if you can make their number from your roll. Your decision in all that is how you put together the dice. You can never use the result of just one die, you have to sum up at least two to place a NQMP. You have four dice, so you can make two sums of two dice each and place two NQMPs, or you can sum up three or four for a better result and place only one. Where you place a NQMP decides that villager’s future, but in the end it also decides about your victory. That’s why we’re all here, after all, isn’t it? Each type of building has a different way to get you there, and it’s up to you to pick the right ones. How many of each type of building there are depends on the number of players and on a bit of happenstance, so which buildings are the right ones is not set in stone. 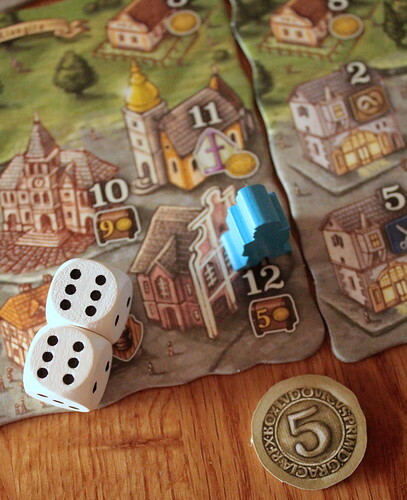 The basic shops (bakery, butchery, dairy and tailor shop, values two to five) score victory points, counted in coins in Bohemian Villages, only at the end of the game. If your people only have one of these shops it’s only worth a measly coin, but if they control one of each the number goes up to a whooping twenty. Easier said than done, of course, because there are not enough shops for every player to get a full set and other players can kick you out your shop when they roll the right number. Rolling a six and placing a NQMP on a Flour Mill is much safer because you can’t be booted from there, and it’s still a profitable endeavor. When you take a Flour Mill you take a bag of flour, too. As soon as all Flour Mill’s are occupied, you sell those bags for two coins a piece, and then you take your NQMPs from the Mills back. Don’t underestimate that last part. Usually your people stay put on the board unless someone kicks them out. The Flour Mills make them work for you more than once. The same goes for the famous Bohemian Glass Factories you can occupy on a seven, only each glass from them is worth three coins. For eight points you can have a Farm that scores even more often. Every time you place a NQMP on a Farm you receive one coin for each Farm you now control. But why stop there? 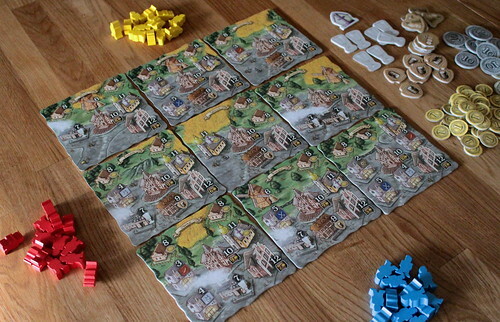 Rolling a nine you can get an Inn and score one coin at the start of every turn. The Inn just needs to be opened first, which happens as soon as any three NQMPs are in the same village as the inn, but from then on it’s free money. 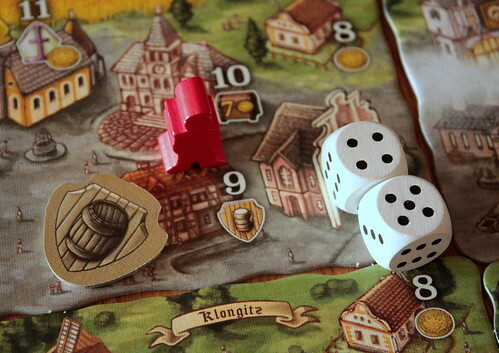 Other occupied buildings in the village are also important for the Town Halls you can occupy with a roll of ten. Those are worth different numbers of coins that they pay out at the end of the game, but they only pay at all if all buildings in that village are occupied when the game ends. It’s a popular pastime to score Mills and Glass Factories just before the game ends to make sure you have an empty building and your Town Hall is worthless. Yeah, opponents can be so petty. You still want that Town Hall, though, because having none of them costs you five points. Your family is worth nothing if no one is a mayor. What do I need for a Pope? Just as important is someone being a priest. Or even better, more than one someone. Churches (elevens) score by majority at the end of the game, giving a chuck of coin to the players controlling the most and second most Churches. Churches have another way to create income. 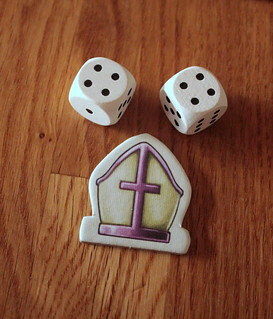 When you roll doubles, you can choose to use those dice not to occupy a building but to take the Bishop instead. As long as you have it, all your churches score one coin at the start of your turn. But hold on to that hat, anyone rolling doubles can take it away from you. And finally, the easiest one: Roll a twelve and you can take a Manor that immediately scores a considerable amount of coin. And if absolutely none of those things work, or don’t sound attractive to you, then you can use any two dice to take a special action tile that lets you re-roll some dice on a later turn. The game ends when a player starts their turn and doesn’t have any NQMPs left, then you score everything that happens at game’s end, add up your coins and you have a winner. That last bit about when the game ends sounds so innocent, but it turned out to be one of our biggest problems with Bohemian Villages. When you play with people keeping count of everyone’s score, like we often do in our test games, they can easily double the thirty minutes a game should take because they won’t let the game end unless they are in the lead. Every time someone placed their last NQMP another player who was not in the lead would kick it out just to keep the game going until they could win. It’s probably not in the spirit of the game, and if you play with your family or more relaxed gamers it shouldn’t be a problem. But if you have at least two friends obsessed with winning, don’t invite them to play Bohemian Villages. But if you do have more relaxed players then Bohemian Villages is pretty fun. Despite the amount of dice rolled, it’s quite a tactical game with many decisions. The buildings’ values differ from game to game, because you may have more or fewer of them. They also differ over the course of one game. The shops are more valuable late in the game when there’s a chance no one will kick you out before the end, Mills and Glass Factories are better early on when it’s certain they will fill up and score. But with the uncertainty of when the game will actually end late and early game are moving targets. All that keeps you on your toes the whole game. How to best use your dice is another thing you’ll often have to think about. Make sub-optimal pairs but place two NQMPs? Add three or four dice together but place only one? Maybe use some dice to get a Special Action Tile for later? All those decisions are interesting and meaningful, but they do still depend on the dice. Sometimes, especially late in the game, you’ll get a role that can’t do anything good for you. And especially late in the game that roll may decide the winner. Some of us found they had enough control over the outcome. Other’s felt sabotaged by the dice with nothing to do about it, and betrayed because it seemed like they should have control. This is a game where I really can’t tell you if you’ll be happy with the luck/strategy balance. It will depend on how much frustration from the dice you can take.